It seems like you can’t go anywhere in the charging space these days without hearing about Power Delivery technology. Since Apple made the switch to USB-C for the iPad in 2018, more and more users are becoming familiar with the benefits of the high-speed USB-C protocol. But with so many PD chargers on the market, how do you know which one is right for you? Read on for a simple introduction that demystifies the choices you have regarding USB-C Power Delivery. There’s a surprise at the end, so you stand to gain something more than a better knowledge of Power Delivery! Based on your devices and charging needs, we can group PD chargers into the following categories: 18W, 30W, 45W, 60W, and Over 60W. It’s worth noting that higher wattages are compatible with lower ones, meaning that a 30W PD charger has all the features of an 18W charger, just with a higher potential output for devices that demand it. Therefore, the chargers we recommend as ideal for certain devices are not the only compatible chargers by a long shot. An 18W Power Delivery charger meets the high-speed charging threshold of smartphones and some tablets, including iPhone 8 and later, Samsung Galaxy 8+ and above, the latest generation of Pixel phones, and Nintendo Switch. Power Delivery chargers in this class or above have a distinct advantage over Apple’s stock chargers. An 18W PD charger gets iPhone up to 50% of capacity in 30 minutes, while a stock charger only reaches 20% in the same amount of time. This means Power Delivery chargers are 2.5 times faster than an iPhone stock charger. 30W chargers provide all the above-mentioned benefits of 18W chargers, but with the additional ability to provide full-speed charging for laptops and most tablets, including the 12-inch MacBook and iPad Pro. It’s worth noting, however, that Apple’s stock charger for the 12-inch MacBook is sufficient to provide full speed charging, though users may still seek out other options for their improved portability; chargers that use GaN technology, like PowerPort Atom PD 1, are a good example. Not many devices have reached this threshold yet; the most notable is the 2018 MacBook Air. Although we don’t have a 45W charger at this time, it’s certainly something we’ve thought about. 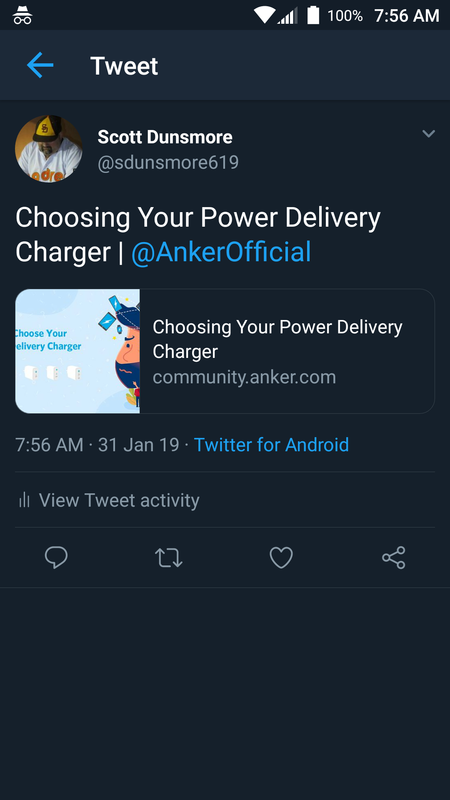 What about you, Anker fans? 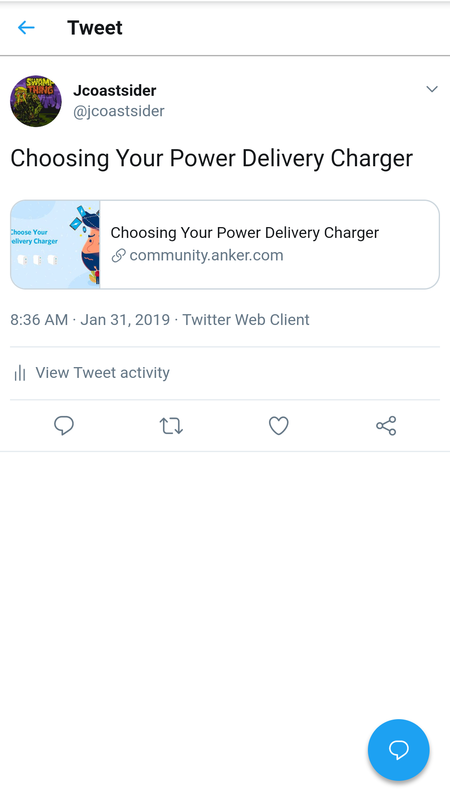 Do you support the idea of Anker releasing a 45W PD charger? This next-tier option expands compatibility even further, reaching the full-speed charging threshold for the 13-inch MacBook, Dell XPS 13, and Xiaomi Air. Currently, we only have one charger in this class: PowerPort Speed 1. 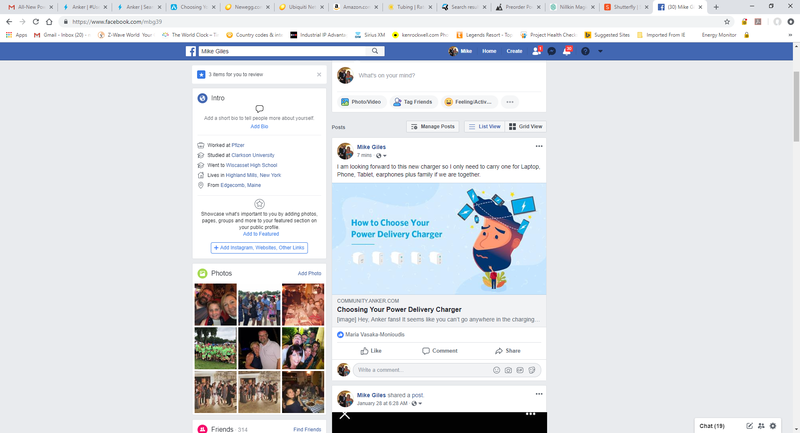 There are very few 60W chargers on the market because, except for the 15’’ MacBook Pro, relatively few devices require such a high output for full-speed charging. However, coming this February is PowerPort Atom PD 4, a 100W charger. But that’s not necessarily 100W of power for just one device. With 4 charging ports, this iteration of the Atom series needs all the power it can get. Capable of providing up to 100W of charging power when one device is connected to a Power Delivery port, or splitting the power to charge 2 laptop and 2 phones at the same time, PowerPort Atom PD 4 is a great choice for families or frequent travelers who often carry a ton of devices. If you kept up with our adventures at CES, you’ll know that PowerPort Atom PD 4 caused enough excitement to garner an Honoree recognition. But we know, it can be a little difficult to get excited about a product you haven’t even seen yet. That’s why we’re giving away PowerPort Atom PD 4 for free! All you have to do is share this blog entry on social media, and screenshot it in the comments below for your chance to win. We’ll announce the winners by February 15th, 2019. Giveaway open to residents in the US only. 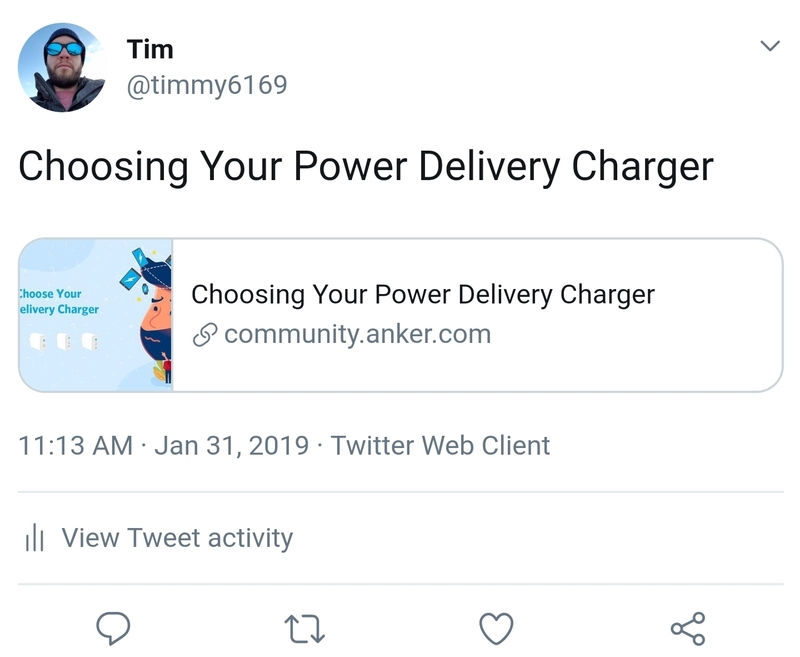 We hope you feel a little more informed about your purchase decisions, Anker fans. Let us know your thoughts below, and as always, Power On! We're happy to see that you're enjoying reading this post and we will bring up more informative posts in the future. The lucky winner who can get this PowerPort Atom PD 4 goes to @cshenoy. Congratulations! "Anker PowerPort 5-Port USB C Ladegerät 60W Wandladegerät"
Even an old couple has to charge many things at home and when travelling! Good article! My Chromebook and work laptop both charge via USB-C, so it would be great to charge them both at the same time while traveling. As a moderator, you need to check each post! You sell USB PD hubs which take power themselves. So a laptop wanting 30W needs a hub receiving 50W. Looking forward to seeing your 100W charge and to avoid disappointment hope your engineer makes a corded and wall variants. You also need to merge IQ2 with PD to make IQ3. Or allow the power budget to be shared across IQ2 and PD. You currently are splitting that in dedicated budget per socket so in effect wasting space. If that doesn't makes sense then pick a simple example, 18W. An 18W charger has 2 sockets one is IQ2 other is PD, so you can connect any phone to it. If you connect 2 devices they'd make both ports deliver 5V 1.8A each and then most devices would still charge. Then take up a level 30W. 2 sockets. 1 device would see 30W but two would see 15W each. I think that's what you're doing with the 4 port but details are light. Currently you are not doing this. Example is your Poweport PD 2. It has 30W AC/DC, which drives it's physical size. It only gives out 18W even if just 1 of 2 ports used so the 30W is wasted. It isn't a 30W PD when 1 device which becomes 18W when 2nd part used at the same time. So it's basically quite dumb. Oho, you will never be the "Big brother" who is watching us, Neil! I don’t have twitter or Facebook. Can I share it on reddit? Posted on Facebook. Cant wait for this. I would also like to suggest adding Qi. What makes me angry that so called "social media" are necessary. I never used one and WILL NEVER use such. Yeah. I don’t like “social” media. People should just talk to each other and meet with each other. And if you don’t live near each other you can call them. I use reddit some but not a ton. It’s not really social media though. I'll be upgrading my iPhone 8 Plus this summer, and anything is better than the brick Apple includes in the box. Finally being able to take full advantage of Fast Charging would be nice.